Quick Ship 6 Foot Rectangular Recycled Plastic Picnic Table, 260 lbs. 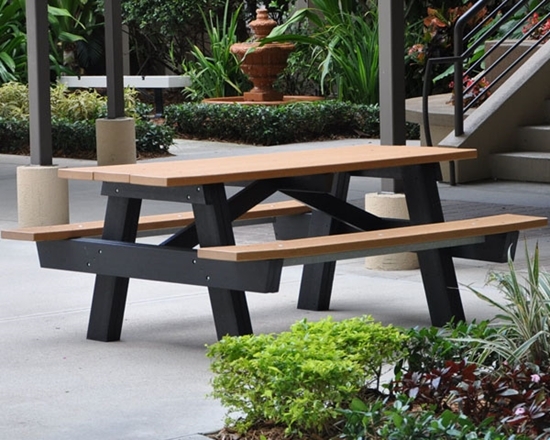 This 6 foot recycled plastic picnic table is made with 100% recycled materials. Recycled plastic lumber resembles natural wood without all the rotting and splintering. Made in the USA with 3 year manufacturer's warranty. Our environmentally friendly recycled plastic picnic tables are in stock and ready to ship fast to your school or park. Ships out fast in 3 business days up to a quantity of 4. Quick Ship 7.5 Foot ADA Rectangular Recycled Plastic Picnic Table, 435 lbs. Quick Ship Trash Cans. 32 Gallon Recycled Plastic Trash Can with Lid and Liner, 60 lbs.